Google map showing Bayshore Village on the north shore of Lake Simcoe; Satellite map showing layout of the village. The community is served by both public and Catholic school systems, and is located in close proximity to Georgian College and Lakehead University. Medical facilities including Soldiers’ Memorial Hospital are available in Orillia. 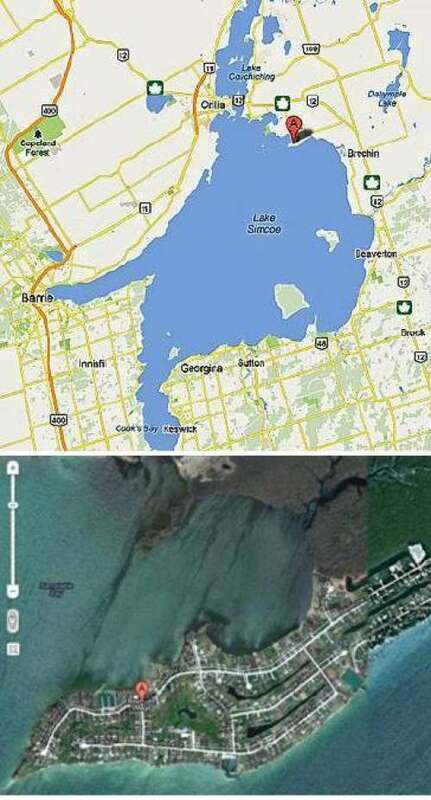 The Google map at right shows the location of Bayshore Village in relation to Orillia, Brechin, Barrie (and Toronto and Muskoka, off the map). The satellite map of the peninsula shows the layout of Bayshore Village, with Lake Simcoe at the bottom (south) of the picture, and Barnstable Bay above the peninsula. The red marker is north-west of the par three golf course. South of the golf course pond, you can see the white building called the Hayloft, which is our community centre. For more details, please click on one of the headings above -- Amenities, Community, or Governance. To read a narrative of the history of Bayshore Village, click on the link below.